This massive, lavish, stunningly beautiful 12-pound book is a collaborative project produced by the Analog Tattoo Arts Kolectiv (ATAK), documenting and exhibiting a comprehensive collection of sleeves by the world tattoo community. Tattooers and collectors from around the globe graciously contributed to this complex collective undertaking. During photo shoots on several continents, sixty-seven sleeves were extensively documented by house photographer Max Dolberg. Next, the raw material was combined into three dynamic composite models: windwill, wingspan, and rotation. The final product offers a unique and singular view of the sleeve that, as of yet, has not been put forth. 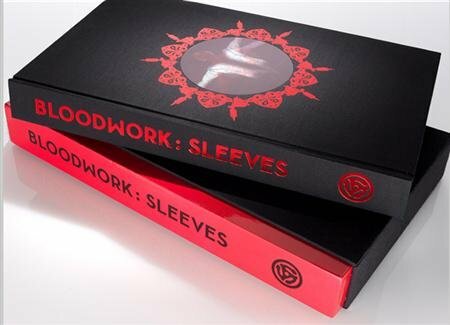 The extensive range of work within Bloodwork: Sleeves provides a broad view of contemporary tattooers working today, compiling an unparalleled historical document for this and future generations. Clothbound in multilayer die-cut hard slipcase. 16" by 9"; 30" wide with foldout. 350 hand-bound pages printed on heavy art paper. Metallic, spot matte and gloss varnishes. Lenticular cover imagery. Limited edition of 1500 hand-numbered copies.